• Deforestation causes greater carbon-dioxide emissions annually than all the vehicles driven in the U.S. and China. • Almost 3 million people in the developing world die each year from smoke-related injuries due to cooking with wood-fueled fire. • Two million children die each year from water-borne diseases. Now, a solar device developed more than two centuries ago may help eliminate these three terrible modern plagues. 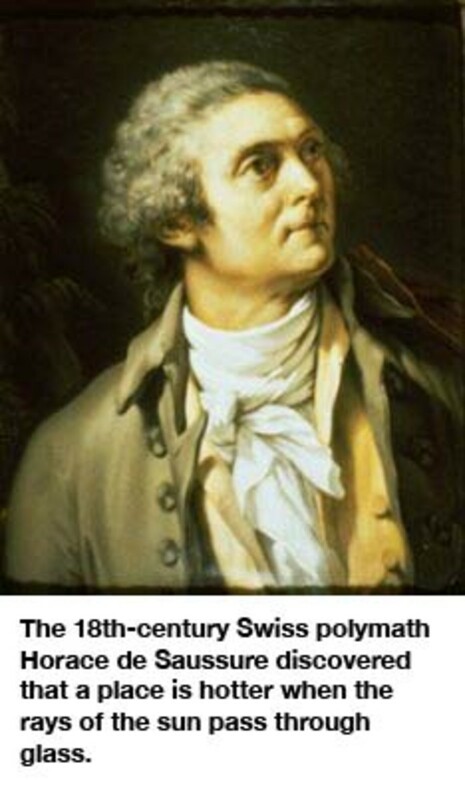 In the middle of the 18th century, the Swiss polymath Horace de Saussure observed, "It is a known fact, and a fact that has been probably known for a long time, that a room, a carriage, or any other place is hotter when the rays of the sun pass through glass." Surprised that such a common phenomenon had not led to any empirical research on the maximum temperature attainable in a glass solar heat trap, in 1767, de Saussure set out to determine how effectively glass could collect the energy of the sun. He built a small rectangular box out of half-inch pine and lined it with black cork. Three separate sheets of glass covered the top of the box. When exposed to the sun, the bottom of the box reached a temperature of 228 degrees F — some 16 degrees above the boiling point of water. Others reproduced de Saussure&apos;s results. For example, the noted 19th-century astronomer Sir John Herschel used a similarly designed box to cook meals while on an expedition in South Africa. "As these temperatures far surpass that of boiling water, some amusing experiments were made by exposing eggs, meat, etc., to the solar heat inside the box, all of which were found perfectly cooked," he reported. "On one occasion a very respectable stew of meat was prepared and eaten with no small relish by the entertained bystanders." De Saussure believed that "someday some usefulness might be drawn from this device for it is actually quite small, inexpensive, and easy to make." He was right. Earlier this month the FT Climate Change Challenge found a simplified remake of de Saussure&apos;s invention so compelling as a solution to the three plagues — deforestation, death from cooking with fire and intake of dirty water — that it awarded the modern device&apos;s designer, Jon Bøhmer a $75,000 prize. 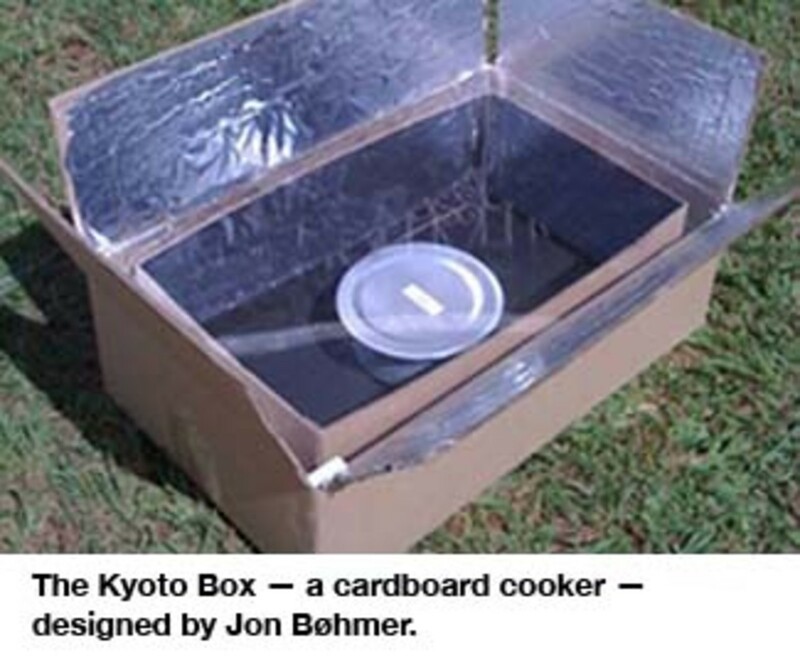 Costing only $5 to make, the solar cooker consists of two cardboard boxes, a smaller one stuffed inside a larger box. Insulating material, such as straw or newspapers, is stuffed between the two boxes. The inside is painted black to absorb the sun&apos;s rays and turn them into heat. The "chef" places a metal pot at the bottom of the box and covers the top with a removable transparent cover. Aluminum lines the opened flaps of the box to focus even more sunlight into the box. The cooker works the same way greenhouse gases heat the earth. Transparent materials have a peculiar property as greenhouse gases do: They easily allow sunshine to pass through but inhibit the ensuing thermal radiation from doing the same. Therefore, the trapped energy heats up the interior of the box and raises temperatures high enough to cook meals and boil water, eliminating the need for firewood and allowing potable water to be produced. The Norwegian-born Bøhmer&apos;s simple design makes it easy to manufacture, which apparently gives it a leg up on more elaborate cardboard cookers. Existing cardboard plants can build the solar cooker, and one Kenyan factory estimates that it can produce more than 2 million per month. The designer dreams of a vast distribution network throughout the developing world, where women, traditionally the ones who collect firewood and do the cooking, unpack trucks piled high with the boxes and pass them out to neighbors. As these new cookers eliminate the emission of two tons of carbon per family per year, their cost could be covered by carbon credits from the developed world. That is why Bøhmer has named the device "the Kyoto Box," after the Kyoto Protocol to reduce greenhouse-gas buildup. Continuing the traditional way of cooking spells disaster, as Bøhmer himself acknowledges: "With as many people as there are in the developing world today, they can&apos;t just cook using trees. They will finish off all the trees."